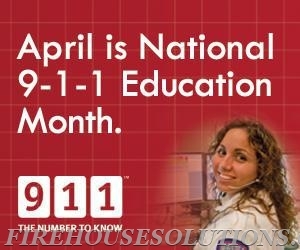 April is National 9-1-1 Education Month! April is National 9-11 Education Month! We hope you will take a few minutes this month to review three important reminders when using 911. Call If You Can, Text If You Can’t: Text-to-911 service is available in an increasing number of communities around the country. The service benefits individuals who are deaf, hard of hearing or in a situation where they cannot speak and make a voice call. However, a traditional voice call, if possible, is still the best way to reach emergency services. Know Your Location: Wireless calls to 911 provide location information, but 9-1-1 call takers may need more specific information. Be prepared to provide detailed information on where you are so that help can get to you as quickly as possible. Stay Calm and Don’t Hang Up: Until you are instructed to do otherwise, stay on the line so you can provide any necessary information or assistance to the 911 call taker. Even if you accidentally call 911 don’t hang up. Inform the call taker that you dialed accidentally and that there is no emergency.